The following rules are a excerpt from our unoffical "Stunt Pilots and Zeppelin Tactics" Expansion. House Rule: Which plane may I fly? Look at the max. speed, max. Gs and acceleration. Take the highest value and compare it to your Natural Touch Level, if your level is even or higher you may fly this plane. In the offical rules you have to roll for the complete G's if you fly two maneuvers with a G value of 3 or more in follow. You have only to roll for the complete G's on the second roll, if both maneuvers are higher than your planes max. G's. 6-7 The first hit +/- 1 column, each additional hit may only be adjusted one column in the direction of the first hit. 8 The first hit +/- 2 columns, each additional hit may only be adjusted one column in the direction of the first hit. 9 The first hit +/- 2 columns, each additional hit +/-1 column. 10 The first hit +/- 2 columns, each additional hit +/-2 column. 11 As SH 10, additional the zone roll (port, starbord, nose, tail) may also adjusted by +/-1 point. First hit means the first weapon from one plane that hits during one fire phase. Steady Hand 11 can only can be achieved by getting the "Ace-Of-Aces" feat. Feats are another Houserule that are described in the feats section below. Each G stressing your plane makes your unjam roll 2 points more difficult. You may at any time dumb your fuel. You announce it in your fire phase and it takes until your next fire phase. Mark your empty fuel tank as it was destoryed. In the original rules your pilot is killed if he fails his bail out roll. So we decided to determinate how close the roll was failed. Now you lose 1 constitution for every point below the roll value. Your pilot gets only killed if he loses consitiution points equal or more than his current constitution. If a plane is hit on a box a max. speed zone, is the max. speed reduced to the value of the remaining undamaged max. speed zones. A plane with max. speed 5 is hit at one of its 4 max. speed zones, which means the 3 others are undamaged, it's reduced max. speed is now 3. On the other hand a plane with max. speed 3 is not affected if only one max. speed zone was damaged. These tanks should be an advantage, but in the original rules they aren't. Cause a magnesium hit is with these tanks more dangerous. So we decided that a self sealing fuel tank only explodes with a direct hit of magnesium ammunition, not if the magnesium burns into the tank. In the official rules you get 10 lbs. weight back if you remove one rockethardpoint. But any rocket or bomb attached to the hardpoint can have a weight of 125 lbs. So we decided that you gain 135 lbs. by removing one rockethardpoint from your plane. Superior weapons jam at a 1 on 2D10. Premium weapons jam only at a double 1 on 2D10. All planes have some special features, like you know it from "Behind the Crimson Veil". So if you choose to redesign or upgrade a existing plane you can upgrade or downgrade a feature only by one level. This means if your plane has Heavy Stick you can't upgrade it to Light Stick but you may remove the Heavy Stick. This rule does not apply to weapons and engine modifikations! The following rules are a excerpt from our unoffical "Stunt Pilots and Zeppelin Tactics" Expansion. If you are running a campaing with GMs (Game Masters) and Players, you may find this rules very usefull, additional to the normal repair costs described in "Behind the Crimson Veil". We think this rule is more realistic than the original one. Fuel costs applying before each mission. Costs of ammunition and rockets are described in "Behind the Crimson Veil". You have to pay ammunition before each mission, regardless if you shoot with a specific gun in the last mission or not. Rockets on the other hand cost only something if you buy new ones. You may store unused rockets in a hangar or your players base. Appart from the normal repair costs of plane you have to pay a maintian fee for every 5 missions, which is 1% of the original price of your plane (incl. all modification costs). If your players have no zepplin or personal base where they can land and maintain thier planes, they have to rent a hangar. This rental fee depends on the size of the plane. Size = 12 - base target number. The fee is the plane size multipled with the base rental fee. If you want to sell a used plane you earn 2/3 * (original price - unrepaired damage + modifications). Also single components of a plane such as weapons can be sold for 2/3 of the original price. The following rules are a excerpt from our unoffical "Stunt Pilots and Zeppelin Tactics" Expansion. As you see on our self created maps (Downloads/Mapsection) these game mechanics are an important part of our houserules. We distinguish between three types of opstacles, Dot-Obstacles, Destroyable-Obstacles and Fly-Through-Obstacles. The Dot-Obstacle are marked with colored dots on our maps. The destroyable ones are marked with a colored "explosion-star" and the Fly-Through-Obstacles are marked with a white circle with a Number (the difficulty) in it. As you know it from the original rules these obstacles are shown on a map by red dots. We emphasized the red dots with yellow and green ones. You know the rule for red dots, where you crash if you do not roll a 9 or 10 on D10, this remains unchanged. The yellow and green dots are less dangerous than red dots. Flying over a yellow dot hex counts as a maneuver stressing your plane with 4Gs. If you stop on a yellow dotted hex you have to roll a D10 (this is called the stop roll) to determinate if you get on 1-5 a flak damage on the front (roll also for the zone if it is on your wings or your nose). Flying over a green dot hex counts as a maneuver stressing your plane with 2Gs. If you stop on a green dotted hex you have to roll a D10 to determinate if you get on 1-3 a flak damage in the front (like above). Pilots with a Natural Touch 7-8 gain a +1 on the stop roll (not for rolling the Gs), furthermore they get a +2 to the roll if their Natural Touch is 9-10. Yellow and green dots interfere with the line-of-sight and the shooting range. This means if a yellow or green dotted hex is between two planes they may not shoot each other, also their facing is correct. The same applies to tailing another plane. Flare rockets shock range is also blocked by a green or yellow dot, except you place the flare on a yellow or green dot hex. But if one plane is on a yellow or green dot it may shoot and being shooted. If your plot leads you through more than one dot-obstacles you are stressed only by the highest one. But if your move ends on another dot you must additonaly roll the stop roll. Destroyable-Obstacles are marked with a "explosion-star" instead of a dot. They can also have 3 different colors (red, yellow and green). As long as they are intact they count as their Dot-Obstacle counterpart with. The main difference is they can be destoryed during a mission, and then they no longer count as an obstacle. You may destroy such an obstacle in two ways. In both ways the obstacle is gone at the begining of the next turn. This obstacle type counts for all bridges, hangargates, hangars and so on. You really fly through it! You will find Fly-Through-Obstacles on our maps as white circles with their base number an possible direction arrows. If there are no arrows in a circle this obstacle can be flown in any direction. If you want to fly through a obstacle you have to plot your course and add a "O" (for obstacle) to your plot. The base number varies from 5 (very easy) to 14 (extreme hard). 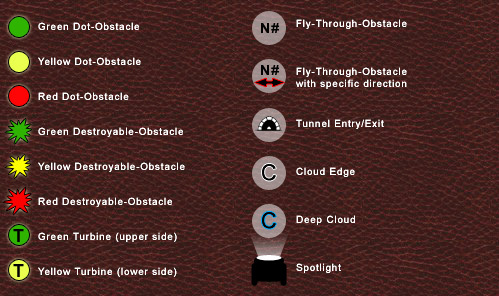 You roll for fly-through obstacles if you enter them, or if you leave them in another round than you entered them, or if you fly a left or right maneuver within such a obstacle. You get one flak damage (frontside) for every 2 points off your roll value (rounding up). Tunnels are also a Fly-Through-Obstacle and marked with the tunnel entry/exit symbol (with a difficulty on it). Tunnels often are more than one hex long, so maneuvers through tunnels often need more than one round. Entering a tunnel is done like a normal Fly-Through Roll. As long as the plane flies in the tunnel only Maneuvers with 1G are allowed to plot (until the plane reached the exit). Also every turn within the tunnel a Fly-Through Roll is necessary. The normal Fly-Through-EPs (see above) +1 EP for each Hex of the tunnels lenght. For the speed calculate the average speed of all your maneuvers through the tunnel(rounding up). Autogyros ease all obstacle related rolls by one! But also autogyros get more damage if they collide with a destroyable obstacle. Which means the flak damage is increased by one. The following rule is from our unoffical compendium "Viva Sky Vegas". Clouds are marked with white or blue "C" Symbols on a white circle. The white ones are the edges of a large cloud or small fluffy ones. The blue ones are the center of large clouds. Cload are limitating or completely block the line of sight. A plane in a cloud may not tail or being tailed. The chance of hitting a plane in a cloud is modified, except for Seeker Rockets if the target has a beeper on it. For each white cloud hex between the attacker and his target the hit-roll gets a malus of one. For each blue cloud hex the hit-roll gets a malus of two. Smoke Rockets are useless within cloud. Flash Rockets are being dambed and have only a 2-hex-effect-radius. Planes collide in a blue cloud hex, if their collision roll differs one point or less, e.g. two planes do not only collide if both roll a 5, but also if one rolls 5 and the other a 4,5 or 6. Turbines have the same effect for flying as the normal dot-obstacles. But they do not block the line-of-sight and you can shoot through such a hex. The following rules are a excerpt form our unoffical "Aces and Gunslingers" Expansion. Many of these feats where inspired from the Wings of Honor Page Flying Schticks Rules and "Wings over Manhattan" squardon special abilities. This rules was developed to give your pilots and wingmen more RPG-like depth and individuality, if you run a campaign. All feats cost EP, so instead of increasing only your pilots stats you can now also buy these feats. Most of the feats have a prerequisite that has to be fulfilled. And some feats have also differnt levels, that must bought separately. Feats that are used for any air combat or flight action can only used by the pilot if he is not shocked. Prerequisite:	min. 1500 EP (incl. starting EP) and the required skill at 10. The Pilot (and also his Gunner) gets for jumping off plane to another, or to a zeppelin a bonus +2 on his roll. This bonus is also granted for rolls for climbing actions outside planes or zeppelines. but it is not an additional Bail-out bonus!! This feat is most usefull for boarding parties. This Feat allows you to outmaneuver an opponent in the same Hex. Instead of a normal collision roll, both pilots roll D10/2 (D5). If the pilot with the Outmaneuver feat has Natural Touch 9 or higher he may modify his roll by +/-1. If both Pilots have the same result, a normal collision occured. If both results only differ by one, then a outmanuevering occures. If the Natural Touch of the pilot with this feat is higher than this of his opponent, he may force him to plot no R or L maneuver in the next plot phase. The opponent may not be forced to fly in/through a red dot obstacle with this feat! If both pilots have this feat and the same Natural Touch value, always a normal collosion roll is done. If your Sixth Sense is equal or higher than your opponents Steady Hand (who is firering on you), you may shift successfull hits one row to the outer edge of the current hitzone. Rockets may not shifted this way. Level 1: The Pilot may use Ground- and Zeppelincannons without a malus of -1. Also his Gunner (if he flies a plane with turret) has the same Dead Eye value (not DE -1 as the offical rules say). Level 2: Like Level 1 plus, he gets a bonus of +1 for firing rockets and bombs. The pilot may re-roll one stressing or pushing roll (e.g. Gs, Accel. Stalling, Max. Speed) once per mission. Instead of fireing weapons or unjam, the Pilot may repair von box of internal damage per turn. But he have to fly only straight maneuvers during the repair action! This is only a provisional repair and has to be repaired normaly after the aircombat again. During the aircombat this makeshift counts as a normal armor box. You may not repair componets on the wings, tanks or rockethardpoints, this way. During ground combats this pilot may use 2 handguns at once. He may target the same opponent, or 2 different opponents. When targeting the same opponet the weapons hit modifier are added (and only 1 damage roll is done). If targeting 2 different opponents each shot is resolved separate. The pilot gets a bonus of 2 points for finding secret doors and rooms. And he gets a bonus of 3 points for disabling securityzones and pick locking doors. After a mission, if you lost permanent Constitution, your are loosing one permanent Constitution point less, but at least one point. During a mission you heal one additional CO point, if you use a First-Aid-Kit (this works also if you heal your partners). This Feat works only if the pilot is on the zeppelins bridge and he has the command of the zeppelin. As long as the zeppelin radio/antenna is not destroyed, all Gunners of the zeppelin get a Quick Draw bonus of one point. Also all Aircrafts belonging to the zeppelin need not to roll for collision or obstacle if the end their movement on a zeppelin Hex. Level 1: Gives a bonus of one point during pick locking or disabling bombs. And you can mount/repair protoype components 5% cheaper. Level 2: Additional to level 1, he may repair a prototype component with a chance of 20%, for triple cost of a normal component of the same type. The money is alway gone and you may retry the repair between each mission once. Level 3: The repair chance is increased to 40%. Additional he gets a chance of 20% to reverse engineer a prototype component for the fivefold cost of a normal component. The money is alway gone and you may retry the repair between each mission once. And repaired prototype weapons do not get the -1 modifier for repair anymore (see BtCV page 61). Protoype componets are very special parts for aircraft, that cannot bought! You can only acquire them as a mission objective. Examples for this componenets are Light-Weight-Weapons or experimental engines. Level 1: +1 on attack value. Level 2: +1 on attack value, damage value and base target number. Level 3: +2 on attack value and base target number. +1 damage value. Any taken CO damage is reduced by 1 (min 1 point of damage). During collisions receives the pilot with this feat on collision damage less and deals one additional collision damage to his opponent. If both pilots have this feat, the pilot with the higher Natural Touch can use the feat. If both have the same Natural Touch value normal collision damage is resolved. Level 1: The Pilot gets a +1 bonus on all obstacle rolls and stunts. Level 2: The Pilot gets a +2 bonus on all obstacle rolls and stunts. Level 1: Repair costs for planes are reducted by 20%, and a bonus +1 for tuning up the engine before a mission. Level 2: Additional to the level 1 effects, repair costs for zeppelins are decreased by 10% and modify plane costs are reduced by 10%. In the setup phase of the mission the pilot can adjust his starting position. After all aircrafts are placed on the table he can move his aircraft his Sixth Sense value in Hexes and change his facing in any direction. This may result in a taling position. If more than one pilot has this feat, this special movement starts with the pilot with the lowest Sixth Sense value. Each Pilot knows his mother tongue and gets it for free. This feat can be bought several times. Level 1: The Pilot gets a +1 bonus for attacking ground targets with his guns. Level 2: If he ends his movement in the same hex as an opponent and he flies the opposite direction +/- one hex-side, he may fire on his opponent with an additional deduction of one point. The speed of both aircraft doesn't matter (see official rules). This fire action is only resolved if no collision occured. The opponent may fire back if he has also Strafing Level 2. Only a hero pilot (not a wingman) can acquire this feat. Only one pilot per Squadron may use this feat, if there are more pilots in a squadron with this feat. This has to be setup before the mission begins and the leader may not changed during the mission. As long as the radio of both planes are intact the leader may share a hex with any of his squadron members, without a collision roll. You manipulate the opposite gender. Only usefull if you run campaings, where you can use this feat to acquire additional informations from NPCs. This feat can be bought several times. Only usefull if you run campaings, where you can use this feat to acquire additional informations. Level 1: The Pilot gets +1 bonus on all zeppelin maneuver rolls. Level 2: The Pilot gets +2 bonus on all zeppelin maneuver rolls. These Rules were designed for one of our early scenarios, called "The Secret of Cain's Urn". The scenario was used with the Tibet Hidden Valley maps (which are found in our map section) and counters from our main download section. 2 Breathattacks per turn. Counts as cal 50 Magnesium Gun with 1 hex increased range. Tail and mouth counts both as close combat attacks (see below). The dragon is immune to magnesium ammo. He has 160 Armorpoints (80 nose and 80 tail and has only these zones). If he is hit via the head hex remove the armor points from the nose side and if he is hit from the tail hex remove the point from the tail side. The dragon is dead if he is split apart. 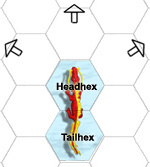 Movement and plotting is done via the head hex of the dragon counter. After the plotting phase the dragon may change his facing by one hex-side to the left or right. He must not pushing his max. speed or max. acceleration (Gs or decel. may be pushed/stressed). He may plot 2 turns in follow G-Zero maneuvers. The constitution is only relevant for shockrolls. Instead of rolling for collision, if a plane end its turn on a hex of the dragon. The Dragon may attack with an additional close combat attack. If the plane is on the head hex it is attack by the dragons mouth, otherwise it is attacked by the tail. * Mod => If the Pilot has a NT of 6 to 8 the modifier is 1, with NT 9 or 10 the modifier is 2. The Dragon's Eye is an oversized glowing gem that was placed in center of the dragon cave. As long as it is intact the dragon is strong (see stats table) but if the gem is destroyed the dragon looses his power (lower stats= and he also looses the first 4 armor point rows from his nose and tail sections. And finaly he may only use his breath attack once per turn. To destory the gem only one hit with a MG is needed. The base target number of the stone is 10.